An article published in the Burkean prompted furious debate on Twitter. Prominent Irish conservatives – including John McGuirk and Declan Ganley – have launched a blistering attack on a Burkean article for promoting racism and eugenics, with some calling for its retraction and others demanding the resignation of the journal’s Editor, Michael O’Dwyer Connolly. 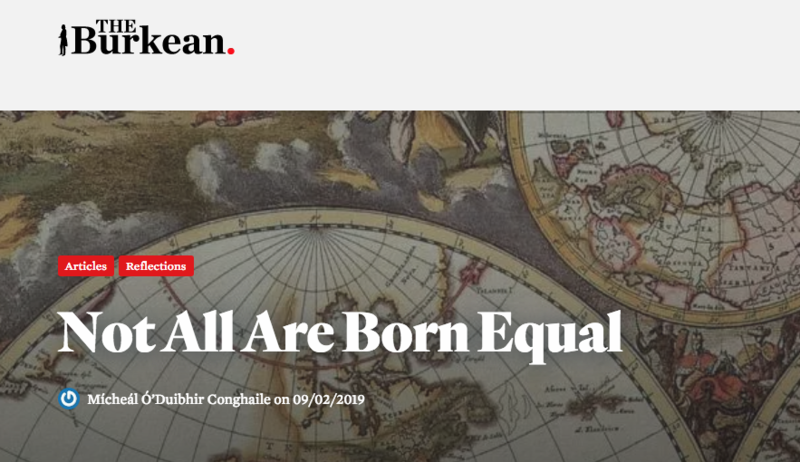 Entitled “Not All Are Born Equal”, the article was published over the weekend on the website of the conservative student publication, sparking furious debate on Twitter. The article, written by O’Dwyer Connolly, argues that global economic inequalities – he singles out “Sub-Saharan Africa” as an example of an area that has not experienced economic growth – are largely down to the genetics of people with different ethnicities. On Twitter, McGuirk, the former director of communications of the Save the 8th campaign, called the article “utterly despicable”. “No website that publishes this kind of garbage represents any “centre right” that I recognise. You insult and abuse the name of Burke”, he said. O’Dwyer Connolly, a University College Dublin (UCD) student, writes extensively in the article about aid to Africa and the theory of convergence – the idea that poorer economies will tend to grow at faster rates than richer economies. “I would propose that we look not only to historical circumstance (which is a important part), but also to genetics to answer this conundrum”, he wrote. “In the modern world”, O’Dwyer Connolly claimed in the article, “even questioning whether ethnic groups are genetically different will even result in being shunned and blacklisted”. McGuirk said white nationalists are the “common enemy of liberals, conservatives, and regular nationalists”, accusing the Burkean of viewing them as “a quirky weird part of the movement”. “They believe in the inate inferiority of some races. They destroy every institution they touch and infiltrate”, McGuirk said. Ganley’s son Micheál was one of the founders of the publication. Neither has any current involvement in the publication. Ganley said in a related Twitter thread that “there is a need for an Irish publisher and repository of intellectual material true to the Burkean tradition. Eventually there will be one”. Since the publication of the article, the Burkean has called for continued support and donations on Twitter. The Burkean Journal was set up in 2017 by a small group of Trinity students who sought a space to write about conservative issues. Speaking to The University Times at the time, Louis Hoffman, one of the publication’s founders and its then-Deputy Editor, said that its aim was “to promote conservative ideas on campus” in response to the “sterile” debate on campus. Hoffman is no longer involved in the publication. The Burkean Journal went on to expand nationally, recruiting writers and editors from other Irish colleges. Earlier this year, the publication rebranded as the Burkean.